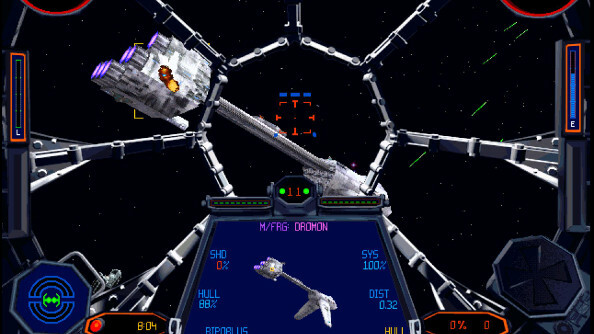 If there’s a campaign that captures TIE Fighter at its very best, it’s Battle II: The Sepan Civil War. It’s still a self-contained snapshot of what the Empire believes is its best version of itself. It’s about being a peacekeeping force that brings safety and security to the people of the galaxy. It’s probably the most seductive argument in favor of the Empire that TIE Fighter makes. By the end of the campaign, you’ll have quelled a civil war that threatened to target civilians. You’ll have rescued child-hostages and forced warring faction to reconcile. It’s an outcome and a campaign you can feel good about. Too bad none of it is really true. The Sepan Civil War campaign, from beginning to end, is about half-truths, misunderstandings, and self-deception. If you take everything your commanders say at face value, everything you do is humanitarian, disinterested, and important to bringing peace to a troubled region. But if you pay attention to what’s happening in the missions, or try and look at the situation from the Sepans’ perspective, it becomes clear that the Empire doesn’t really know what it’s doing, or why. The Empire has a hammer, so the Sepans must be a nail. The campaign opens with the Victory-class Star Destroyer Protector hastily intervening in an escalating civil war that’s spilled into Imperial space. Two factions, the Dimok and Ripoblus, are at each other’s throats and one of them is attacking the other’s convoy. It’s either the Dimok attacking the Ripoblus or vice versa, and it doesn’t really matter. The two factions are interchangeable: they fly the same spacecraft, they attempt to commit that same kind of crimes against each other. Even their names, reminiscent of “Democracy” or “Republic” or maybe “Democrat” and “Republican” suggest two related forms of government that are anathema to the Empire. Across the campaign, you literally can’t tell the Dimoks and Ripoblus apart. From the Imperial perspective, what does the difference matter? It’s important to stress that the Empire are invited into this fight. Both the Dimoks and Ripoblus beg the Protector for help. Both factions are trying to figure out how they can use the Empire as a shield against the other while they prepare to win the ultimate war. The Empire gets a series of urgent requests for policing, and it obliges. You and your commanders seem to have no context for what’s happening when the campaign begins, except a vague knowledge that the two factions have been at war for years. But from the first mission, the people you’re trying to suppress are trying to tell you that things are not as they seem. 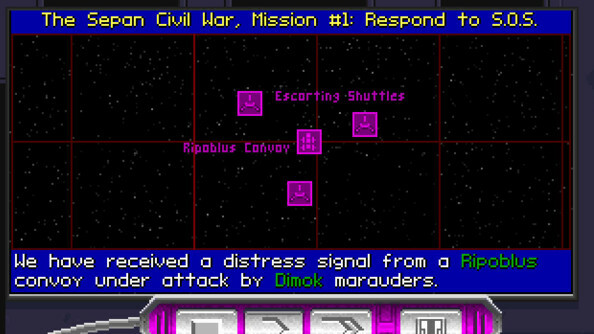 The Ripoblus convoy you protect in the first mission is under attack not because the Dimoks are monsters, but because they claim it is carrying a weapons shipment that will be used in the civil war. A mission later, when the shoe is on the other foot, you have to protect a Dimok space station from Ripoblus retaliation, but the Ripoblus are frantically screaming that, no, this scientific space station is actually a weapons laboratory. In both cases, you ignore the warnings and attack anyway. Then, in the aftermath, as an optional side-objective, you discover that you were wrong. The convoy was absolutely carrying weapons, and the space station was absolutely developing and storing weapons technology. Of course, it’s not really your fault or even your commanders’. Yet to believe you’ve absolutely done the right thing in these opening stages requires an acceptance of Imperial paternalism. You don’t care who did what to whom. You don’t care who was lying, or who shot first. All that matter is that you put a stop to the fight and punished both parties for their bad behavior. This seems to be the kind of approach that some Sepans want. Once it’s clear that the Empire is impartial and is uniformly quelling violence in the system, Sepan war refugees flee to the Protector, while Dimok and Ripoblus forces attempt to recapture them. It is suddenly recasts the Star Destroyer: here, it’s not a symbol of oppression or an implicit threat. It’s a symbol of safety and security. And once it becomes clear the Empire isn’t going to let them have their war, the Dimoks and Ripoblous rediscover their common Sepan identity and prepare to fight the Empire. Your mere presence has inadvertently united the factions against you. The first inkling you have that you’re suddenly the new target of the Sepan Civil War is when you learn that Dimok and Ripoblus leaders are meeting to discuss an alliance to toss the Empire out of their system. Your job is to break up the meeting and take the leaders into custody. If there’s a peace treaty, the Empire is going to oversee the negotiations. It’s a sophisticated mission, almost a heist. 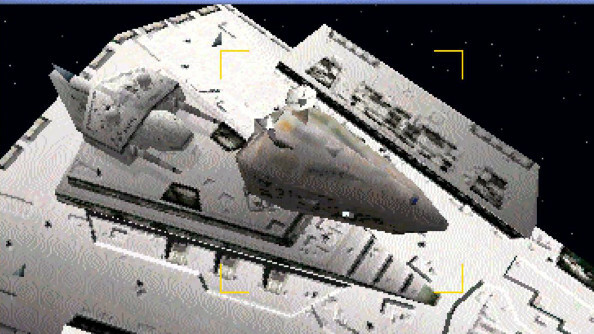 Two groups of Imperial spacecraft, from several different squadrons, deploy to seize the Sepan diplomats. But once you have the diplomats’ shuttles, you discover that there are no diplomats here at all. There’s only children from the leading families of the Dimok and Ripoblus factions. Your CO is disgusted. They were using children as hostages! It’s a good thing, he says, that the Empire was there to put a stop to it. And it’s easy to think share his contempt for the Sepans. But using children as hostages is hardly unprecedented or barbaric. When there’s no legal framework or acceptable arbitrator to mediate disputes, how do you hold people to their agreements? Exchanging family members is neither unreasonable nor barbaric. Through the Empire’s eyes, however, it’s another damning piece of evidence against the Sepans. Once it’s clear that the Sepans are uniting, the Empire’s reaction here is telling. Remember, Sepan is not a part of the Empire. They have no interests in the Sepan system. There are no real stakes in this fight. Yet the moment the Sepans show resistance to Imperial decree, the script flips. Nobody wanted it to come to this, your Flight Officer tells you in the next briefing, but the Empire has no choice but to force the Sepan factions to surrender and recognize Imperial rule. The Empire doesn’t want the Sepan system, but once it has intervened, it cannot be made to leave. The Empire always has to be in charge, because it is the perception of unchallengeable power that keeps it in power. But that same impulse is what gets the Empire into trouble. It gets into fights it doesn’t want and isn’t ready for, simply because it has no easy way of extricating itself from a military adventure that’s gone south. Despite being on the back-foot, the Empire sends in more forces and quickly brings the Sepans to heel. The last cutscene of the campaign is of the assembled Sepan leaders receiving an address from Admiral Harkov, who welcomes them to the Empire and informs them that their civil war is at an end. On the surface, you did a good thing. And maybe even beyond the surface. The Sepans were not going to back down from attacking each other. Their peace treaty was only in reaction to the Empire’s presence. Everything we see suggests that if the Empire left, they’d immediately go back to fighting each other. 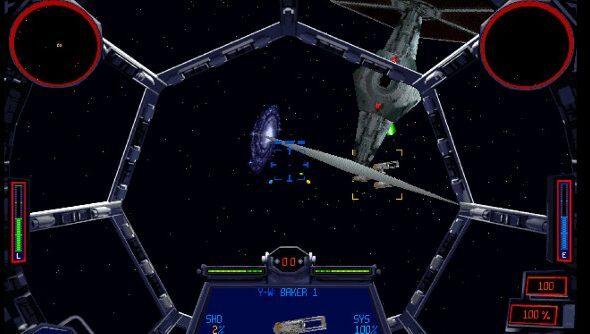 The real-world parallels, both contemporary to TIE Fighter and to events that came before and after its 1994 release, are not hard to spot. 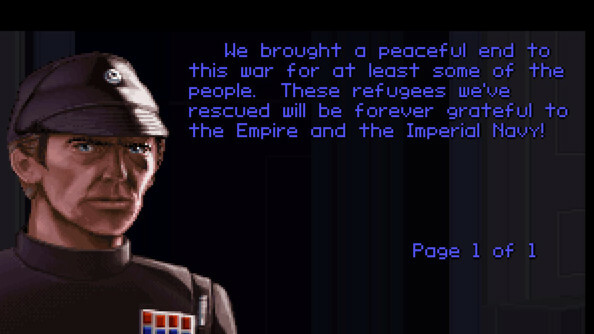 The Empire subjugated a star system because to give it its freedom was to allow a festering civil war and escalating war crimes against the population. Yet the campaign cleverly undercuts the Empire’s own narrative, and complicates the picture. The Empire never really knew what they were getting into. They were never able to get the sides to negotiate a lasting peace. They deepened their involvement in the civil war because they didn’t know what else to do. Nor is the Empire a neutral, trustworthy galactic policeman. Throughout the campaign, Imperial weapons keep turning up in the hands of the Sepan forces. Corrupt Imperial officers are enriching themselves as they deal arms and equipment to the factional fighters. The Empire wants peace and order, but to enforce them across its far-flung domain requires allowing military officers to become a law unto themselves, with minimal oversight and maximum temptation for abuse. With the Sepan Civil War, TIE Fighter engaged seriously with imperialism and its modern descendants. It doesn’t preach, and it doesn’t pretend there are any easy answers. It simply tells a story about the people who try to bring peace from the barrel of a gun. 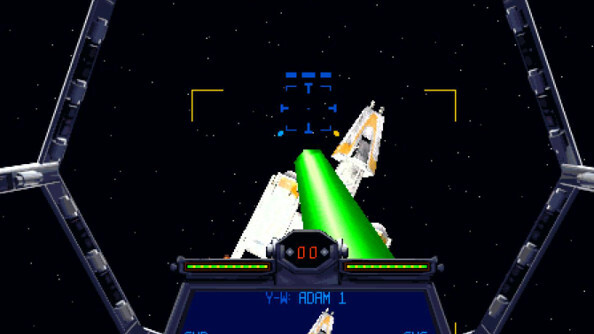 Check our guide to the best Star Wars PC games.